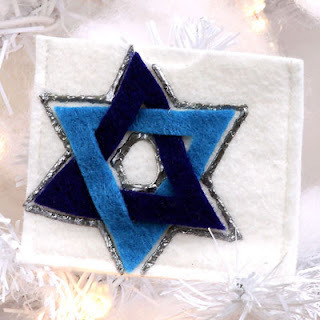 Celebrate the Festival of Lights with a commemorative Star of David gift card holder. Create the symbolic hexagram with colorful felt, Aleene’s Fabric Fusion® and Tulip® 3D Fashion Paint™. 1. Cut white felt. Layer white felt together then sew either horizontally or vertically. Sew on three sides to create pocket. 3. Cut out dip in top layer if desired when finished. 4. Pin and cut triangle patterns from felt. White chalk can be used to draw patterns onto felt if needed. Brush off excess chalk after glue is thoroughly dry. 5. Interlock designs as shown then glue in place. 6. Test flow of 3D Fashion Paint on paper towel using an even pressure on bottle for a smooth line. Detail with Silver Metallic paint. Let thoroughly dry. 7. Keep tip of paint bottle wiped with paper towels for clean lines. FREE SHIPPING through December 13, 2010. Craft on! Click here for today's daily giveaway!